"I have made this dish for company, and every time they ask for the recipe! I hope everyone else likes it as much as we do!" Place oil and butter in a large skillet over medium heat. 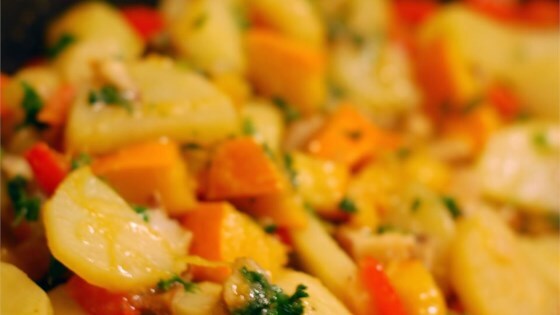 Melt butter and mix in potatoes, mushrooms, pepper, squash, and shallot. Season with garlic powder, salt, and pepper. Cook 25 minutes, stirring occasionally, until potatoes are tender. Mix kale and sage into skillet. Continue cooking 5 minutes, until kale is wilted. Serve and enjoy! Summer vegetables, pancetta, and hot pasta are tossed with a fresh corn "cream". I found this good, but a bit bland. I added a little soy sauce to pick up the flavor. Next time I make it, I would use only half of the potatoes. This is fantastic! The flavors of all the veggies go so well together. It's very savory and satisfying. Make sure you cut up the kale in small pieces for easier eating.